Building out the Houston Bike Plan will hinge on the efforts of many different partner agencies and funding sources. 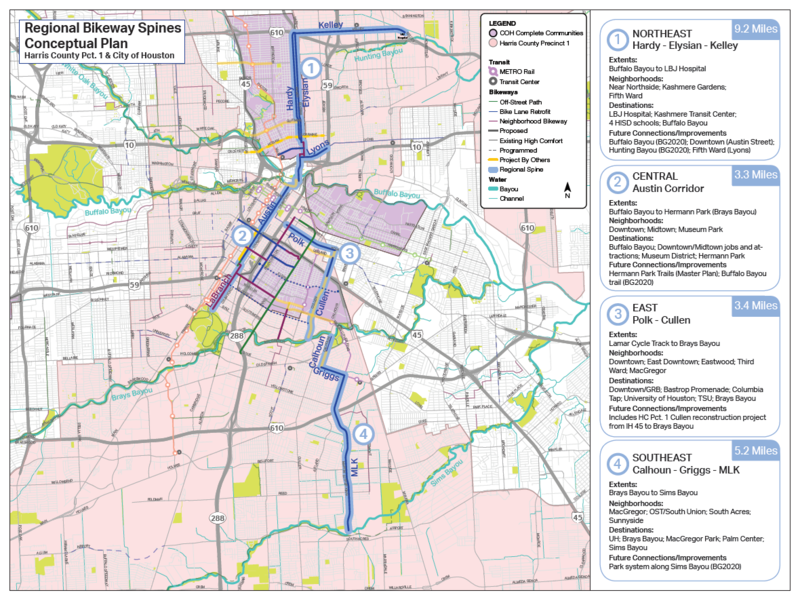 The City of Houston, Harris County, METRO, Houston Parks Board, management districts, private entities – each and all have a unique role to play in expanding Houston’s high-comfort bikeway network. To accelerate those efforts, BikeHouston launched the Build 50 Challenge in April 2018 to galvanize the construction of 50 or more miles of high-comfort bike facilities over the next 12 months. Below is a list of projects underway to meet that goal. Starting with Fiscal Year 2018, the City of Houston Capital Improvement Project (CIP) funds allocate $1.1 million per year towards bicycle infrastructure for the next five years. This funding is stipulated for “short-term retrofit” projects within existing street pavement, such as restriping new lane configurations to accommodate a standard or protected bikeway and minor pavement improvements. Given the aggressive timeline, the City is looking at projects that can be implemented within the 12-month timeframe, such as existing roadway reconfiguration, intersection safety treatments and sidewalk improvements. In some areas, the plan may also includes new sidewalks and improved intersections to protect the safety of both cyclists and pedestrians. A key component of BikeHouston’s challenge is a generous commitment of funding by Commissioner Rodney Ellis of Harris County Precinct One. On April 16, 2018, Commissioner Ellis and Mayor Sylvester Turner initiated a city-county partnership to connect neighborhoods and destinations with high comfort bikeways and to improve pedestrian and bicycle safety. Commissioner Ellis has pledged $10 million from Harris County Precinct One funds to build short-term opportunities identified in the Houston Bike Plan and located within the Precinct One area that have community support. He has challenged the City to do this in a year, or he takes the money back.